Click on one of the thumbnails to see all of the Nyctalus images. 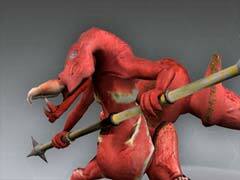 The Nyctalus in one of the enemy creatures the player fights in the game Below & Beneath. This one was modelled, textured and rigged by me. Special features of the rig include a blend shape-driven torso, dynamic IK/FK switches and two-handed weapon animation to name just a few. Read the next paragraphs and browse the gallery to learn everything about the Nyctalus. The game Below & Benath is a fantasy-style action adventure. Together with seven programmers, game designers and artists I've worked on it during my Game Art & Animation course at the Games Academy. For the Nyctalus our team's Lead Artist drew concept sketches, passed them on to me and I got the task to bring this asset into our game. The speciality of this model is its easy-to-use rig. Our team's animator and I worked closely together during the Nyctalus' development. Thanks to his input I built a rig that is not just able to do what the game design requires but also a rig that's user-friendly. First of all, Inverse and Forward Kinematics (IK and FK) control the creature's arms. The clever thing about this system is the IK/FK switch. For modelling and animating we used Autodesk Maya which allows for so-called custom attributes to enhance objects. The IK/FK switch is one of these custom attributes. The animator controls it in Maya's Channel Box. The attribute ranges from 0 to 10 where 0 is no IK at all and 10 is full-strength IK. The attribute is – in Maya lingo – keyable. So in each and every situation the animator chooses the exact amount of IK control he wants. Plus: the transition between IK and FK is always smooth. Video of IK/FK switch and Weapon Magnet. Don't see a video here? Flash Player 8 or higher is required. The second special feature goes hand in hand with the first one. Our game design required the Nyctalus to wield two-handed weapons. When animating e.g. with a staff the animator could constrain the weapon to a joint in one of the hands. Then the staff would follow the hand's movement. But he still had to manually animate the other hand. A smart way to solve this issue is to optionally link one hand to the other – with a customizable offset. The Nyctalus' rig includes this feature. You animate one hand and the other follows automatically. Another major characteristic is the model's blend shape deformation. During an art review class our lecturer criticised that the Nyctalus' torso looked weak compared to its overall appearance. He recommended changing the torso. We eventually implemented blend shapes and killed two birds with one stone. On the one hand the blend shapes send a breathing animation through the body which gives the impression of a wider torso; one that's more robust. On the other hand the breathing lets the Nyctalus look even nastier, a look we strived for. Video of blend shapes, jaw and head controls. Don't see a video here? Flash Player 8 or higher is required. The icing on the cake for this rig comes with two features that further enhance it's usability. 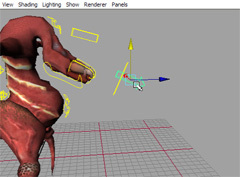 The IK/FK switch for the creature's arms ensures smooth transitions between Inverse and Forward Kinematics. I applied the same principle for both the head movement and the jaw. Our animator wanted control over the exact orientation of the head. He also wanted it to look at a certain target automatically – without the need of counter-animating. Both versions had to be easily accessible. With this rig they are! Like with the IK/FK switch the animator uses a custom attribute in the Channel Box. This one, too, ranges from 0 to 10 and is keyable. Set at 10 the head looks at a NURBS object no matter what the rest of the body does. A value of 0 gives the animator control over the orientation. Everything in between is just a mouse move away. The same is true for the jaw. For general use one attribute drives all four mandibles. It ranges from 0 (jaw is closed) to 10 (wide open). Usually that's enough for our animations. However, when the animator needs a special position he switches to manually rotating each mandible. And again the smooth transition between both states is key to this feature's success. That's it about the Nyctalus – feel free to browse the image gallery at the top of this page. More about the Nyctalus: Maya project, video 1, video 2 and wallpaper.